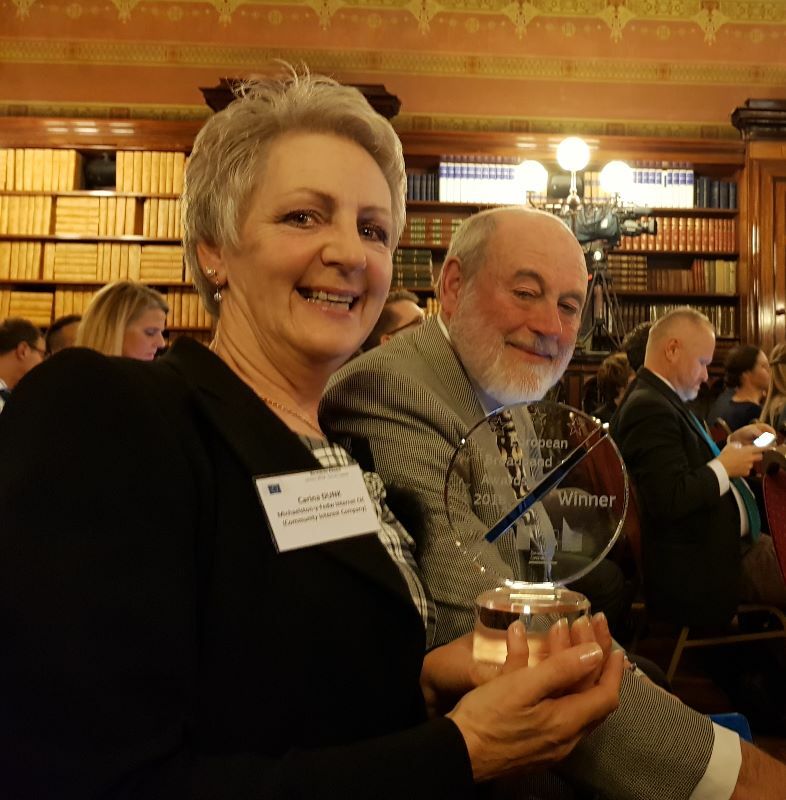 It was an honour and a privilege for both myself and Jim Dunk to represent Michaelston-y-Fedw Internet CIC in Brussels as finalists in the EU Broadband Awards and to subsequently find out that we were the winners of the category ‘Innovative Models of Finance, Business and Investment’. What an exciting moment. Out of 198 projects submitted with only 3 of those from the UK, we were one of 5 winners. This is a magnificent accolade for everyone involved in the Michaelston-y-Fedw Internet CIC project. The Judging panel decided that our project merited the award based on “Being exemplary, in its pursuit of a combination of community investment and use of public funds.”. On our website you can see videos of the awards ceremony. Also shown is the presentation which I had prepared, just in case we won, for the Broadband Day Conference the following day, which was attended by 150 people. Many thanks to Barry Dixon for uploading this to our website with the associated text, within minutes of the events! We basked in the glory and had lots of fellow finalists and telecoms executives coming to us to offer congratulations and to talk about aspects of the project. It was quite surreal, but very satisfying to know that the work put in by everyone was being recognised and rewarded. We won the EU Commission Broadband Award for Innovative Models of Finance, Business and Investment. WELL DONE EVERYONE ~ YOU ALL DESERVE THE RECOGNITION FOR THIS. We are very pleased to say that grant money is coming through from Welsh Government as connections are completed. Work has slowed down considerably now the autumn is upon us, with winter not far behind. There may be a couple of connections completed over the next few weeks but these are ones that have a minimal amount of work left to achieve them. We are very aware that there are around 15 – 20 connections to work on after the New Year and some of these will give us the most challenges ~ but we will overcome the challenges and they will be completed. With 184 connections completed ~ we have completed the majority of the project on time and on budget. When you consider that the initial take up in the early days was less than 100 connections this is a remarkable result. Just occasionally we have had to do a track and trace on a failed connection, to find that either the fibre has snapped in the splice bullet or a duct and fibre has accidentally been damaged, usually by a spade! Thankfully these have been few and easily remedied with connections being reinstated and internet service resumed. PLEASE BE ADVISED THAT ON WEDNESDAY 28TH NOVEMBER THERE WILL BE SOME SHORT INTERUPTIONS TO THE INTERNET SERVICE BETWEEN THE HOURS OF 6.00PM AND 11.00PM. THIS IS BEING CARRIED OUT BY HUB NETWORK SERVICES AS PART OF THEIR PLANNED MAINTENANCE. WE EXPECT MINOR INTERRUPTIONS OF NO MORE THAN A MINUTE AT A TIME, HOWEVER THERE MAY BE SEVERAL OF THEM. TO MINIMISE DISRUPTION ON THE SAME EVENING, WE WILL BE CARRYING OUT AN UPDATE TO THE FIRMWARE OF YOUR ROUTERS. THIS WILL ALSO RESULT IN A SERVICE INTERRUPTION OF ABOUT 1 MINUTE. Now that we have so many connections it is probably a good time to remind everyone what to do if your internet goes down or you lose your connection. Another successful and well attended event that saw people coming and going throughout the whole of the 4 hours. Clearly there was a need for this, and Brin Richards was kept busy the whole time. Thank you Brin, this was much appreciated by everyone who attended. The date of the next meeting is Thursday 10th January 2019 at 7.30 P.M. PLEASE NOTE: The next meeting is after Christmas. As work and activities complete there is less need to catch up on a fortnightly basis.